Morphological analysis is the identification of the structure of morphemes and other linguistic units, such as root words, affixes, or parts of speech. In KoNLPy, there are several different options you can choose for POS tagging. All have the same input-output structure; the input is a phrase, and the output is a list of tagged morphemes. For detailed usage instructions see the tag Package. Now, we do time and performation analysis for executing the pos method for each of the classes in the tag Package. 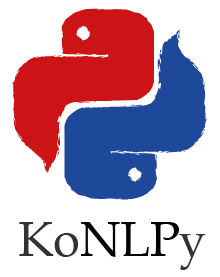 The experiments were carried out on a Intel i7 CPU with 4 cores, Python 2.7, and KoNLPy 0.4.1. Loading time: Class loading time, including dictionary loads. Execution time: Time for executing the pos method for each class, with 100K characters. If we test among a various number of characters, all classes’ execution times increase in an exponential manner. The performance evaluation is replaced with result comparisons for several sample sentences. We can check the spacing algorithm through this example. Desirably, an analyzer would parse this sentence to 아버지가 + 방에 + 들어가신다 (My father enters the room), rather than 아버지 + 가방에 + 들어가신다 (My father goes in the bag). 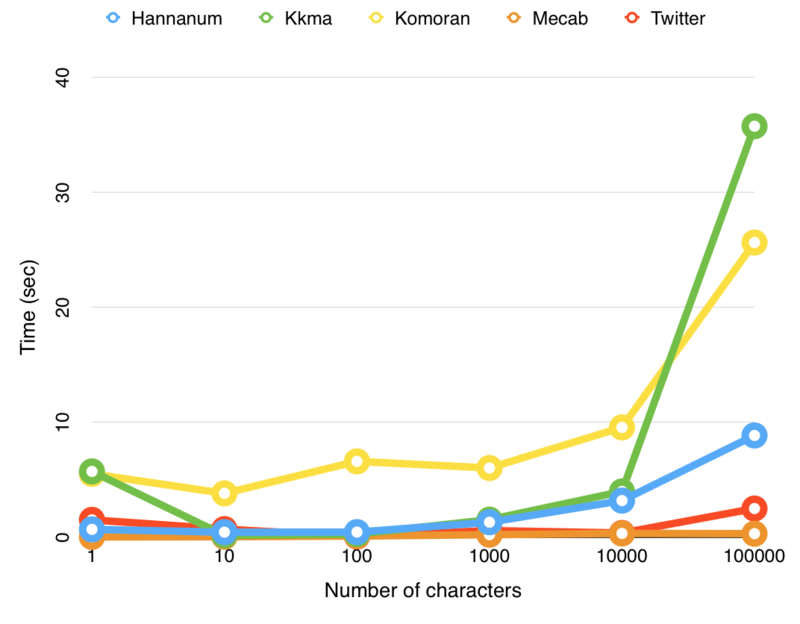 Hannanum and Komoran are careful in spacing uncertain terms, and defaults the whole phrase to nouns. Kkma is more confident, but gets undesirable results. For this result, Mecab shows the best results. If we focus on “나는” in both sentences, we can see whether an analyzer considers the context of words. “나는” in the first sentence should be 나/N + 는/J, and in the second sentence 나(-ㄹ다)/V + 는/E. Kkma properly understands the latter “나는” as a verb, wheras the rest observe it as nouns. How do each of the analyzers deal with slang, or terms that are not included in the dictionary? If you would like to run the experiments yourself, run this code from your local machine. Please note that these are comparisons among KoNLPy classes, and not the original distributions.